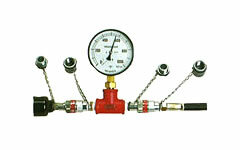 PG-325 Pressure Test Gauges: Izumi Products. The PG-325 is the inline pressure gauge to check inline pressure of the hydraulic system. It is placed between the hydraulic head and the pump by means of a coupler connection. When the hydraulic pump is activated, inner pressure increases and direct reading of inner pressure is obtained. The PG-15F force test gauge was designed to check output force of REC-451F, REC-415B, 15B, CN-58A and EP-50 6 ton tools.